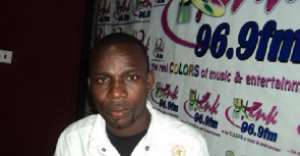 The founder and leader of the Foot of God Chapel, Evangelist Peter Abbam, who also doubles as a professional gospel musician has bitterly lashed out at the current crop of gospel musicians in ghana. According to Evangelist Abbam, most of the current gospel musicians do not qualify to have the title on them because they have turned away from the right way of doing the music that is supposed to be an exaltation of the maker. He charged the current musicians to go back and listen to the songs of great legends like Mark Abraham and try and reproduce such kinds of songs to glorify the name of God and direct Ghanaian Christians on the right path to take. The pastor further made the shocking pronouncement that many of the current female musicians are more than Jezebels because their ways of life are totally bad and do not fit people who call themselves gospel musicians. He listed their dressing, application of heavy makeups, leaving their marriages among others as examples of the things they do which makes them unqualified to be called gospel musicians. On the part of the male gospel musicians, the man of God also stated that they are constantly splashing money on unnecessary clothing and going to the extent of pulling their shorts way below the waist level which is unchristian. He urged the Gospel musicians to practice what they preach in their music and set exemplary lives for their followers.